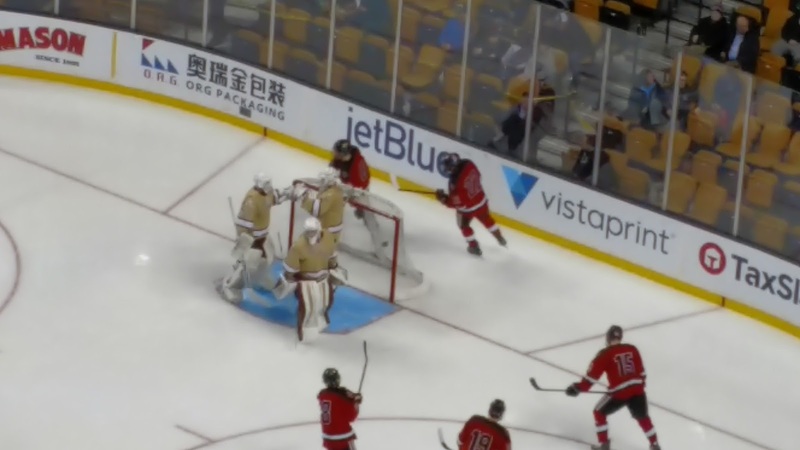 BOSTON - The MIAA Division 1A tournament, better known as the Super 8, can be both exhilarating or devastating, depending on which side of the fence you happen to be on. Both of those feelings came to light during the latter stages of Sunday night's Super 8 final held at TD Garden. Looking to be the first team outside the I-95 corridor to walk away with the 1A title, Pope Francis had it within reach, but failed to secure it. Leading by a goal with under a minute remaining, the Cardinals watched BC High storm back. Joe Dragon netted the tying goal with 50 seconds remaining in regulation, before Maverick Woods ended it with an overtime tally just two minutes in, giving the second-seeded Eagles a 2-1 victory. "All of the guys on our bench were staying positive throughout," said Woods, a senior. "We have faced adversity all season, and once we got one in then we knew the second one would come. On my goal, I was open in the slot and just called for it. Somehow Timmy got it to me and I knew I would bury it." The triumph marks the fifth 1A title for BC High (19-4-1), having last won it in 2007. This contest was also the fourth meeting of the season between these two powers, with the Eagles coming away with a decisive 3-0-1 advantage. "Tonight was just a microcosm of our season," BC High coach John Flaherty said. "We battled right to the end. We knew if we stuck with it and made the puck dangerous at certain times we were going to have success. This is just another phase in our kids lives. They learned from this and don't quit. The character of all of them is unbelievable." After a scoreless first period, Pope Francis, a 10th seed due to an MIAA ruling infraction, was fortunate to keep things at 0-0 after the Eagles continued to pepper Cardinals goaltender Victor Larssen at will, especially in the second frame when they sent 15 shots in his direction. But Larssen, a junior, was sold between the pipes, turning every attempt aside. He finished with 28 saves. Perhaps a bit frustrated by its inability to find the back of the net, BC High would make a costly mental mistake later in the period. A turnover at center ice was scooped up by Max Cocchi. With his head up, Cocchi saw line mate Makem Demers racing into the offensive zone. The junior left winger delivered a nice pass onto Demers' stick and then played spectator, watching Demers do the rest. The junior sprinted in on the Eagles net before lifting a backhanded shot over Luke Garrity for a 1-0 lead at 12:08. Coming out for the third, Pope Francis coach Brian Foley was starting to change his lines with more regularity in an effort of keeping his kids fresh on the big ice surface. Looking to nurse their lead, the Cardinals (17 shots on goal) were continuously clearing the puck away from their own zone and forcing the Eagles to skate back to retrieve. As time ticked off the clock, that game plan seemed to be working well. But not well enough. An errant attempt to move the puck away from its defensive zone, this time it backfired resulted in Dragon picking it up and wasting no time firing a long-range shot top shelf that Larssen never saw coming. Suddenly the momentum the Cardinals (21-5-3) had built had deflated as quickly as a leaky air balloon. The body language shown by Pope Francis was easy to read. They were a mentally defeated club once the game had slithered into overtime. And once BC HIgh saw a chance to strike, it did, courtesy of another turnover with Wood doing the final honors. "You've got to hand it to BC, they played great," said Foley. "We got through that second period where they were bombing away and Victor made some great saves. I thought we played an awesome third and the thing we were doing well was getting pucks out. But we turned it over a couple of times and a good team like that is going to cash it in eventually and they did."